Towards the end of my internship I had the opportunity gain a good bit of experience working with underwater cameras. The aquarium camera was still out of commission from last time we used it for the rockfish survey, so Vallorie was gracious enough to allow me to use her own personal camera and housing. She spent some time with me going over the settings as well as showed me how to set up the housing and check to make sure there were not any leaks. I took the camera into the Halibut Flats exhibit to get some practice using it underwater. I have used underwater video equipment in the past for benthic monitoring surveys, but I had no previous experience taking still shots, which I found to be much more difficult. My first few pictures came out extremely blurry, but after playing around with the lights and concentrating on steadying my hands shots began to come out clearer and crisper. After the dive, Vallorie showed me how to properly clean and take apart the housing. We took the memory card out and put it into the computer to check out my photos. As we looked over them, Vallorie asked me questions about the photos- How could this shot have been better? What would you do differently about the lighting? How could you have changed the point of view to make a more interesting background? She often teaches me by giving me minimal instruction prior to a task, allowing me to figure out how to do something, and more often how not to do something. Inevitably I make mistakes, but end up learning a lot from the errors. 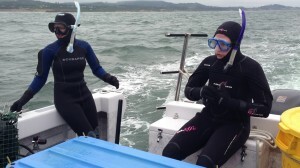 On Wednesday we took the aquarium RV, Gracie Lynn, out for a collection dive; our goal was to collect Enteroctopus dofleini (giant pacific octopus) and jellyfish- in particular Aurelia (moon jellies) and Chrysaora (sea nettles). 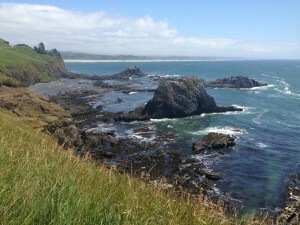 We headed south out of Yaquina Bay towards North Pinnacle, one of my favorite dive sites in this area. As we moved through the water, which was a mellow brown color because of plankton blooms, we kept our eyes pealed for jellies. Jellyfish often congregate where two water masses converge. The water masses can differ in a number of respects including salinity, density, or more commonly for this region- temperature. This time of year we often see upwelling at high spots of the reefs. Cold deep water flows inland and upon hitting the reef it is forced upward. Jellies are often found in abundance where the cold deep water meets the warmer subsurface water and are pushed to the surface by the strong upward currents. When the depth finder signaled that we were over a high point on the reef we all looked overboard to search for jellies. As suspected, we saw them congregating just below the surface. Peter, an intern from the Aquarium Science Program at Oregon Coast Community College, suited up to free dive and jumped in the water. We handed a net down to him and filled a barrel with water to hold the jellies that he would catch. I watched as he put his face in the water to watch below for specimens that were in good enough condition to put on display in the aquarium. He free dove down about 10 feet to where most of the undamaged sea nettles were hiding out. One by one he handed up sea nettles and moon jellies of varying sizes. After about half an hour, the jellies seemed to disperse, and Peter was having more difficulty catching them so we helped him aboard and continued on our way. When we arrived at the top of the pinnacle Jim briefed us on how to best catch an octopus. The easiest method is to lay the bag behind the octopus mantle and then place your hand in front of the octopus. Using this method the octopus will back up on its own into the collection bag. I would be diving with Vallorie and my primary focus was to take photos, although if we saw an octopus we would by all means attempt to bring it up. 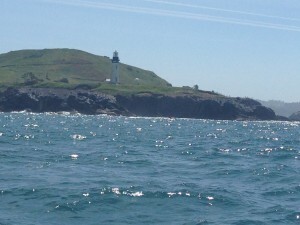 The ocean was much calmer than last week, and the visibility, at about 7 ft., was not bad either. Due to the relatively mild conditions, Vallorie felt it was a great opportunity to load me with a few more tasks than I would normally take on. I would handle the reel, camera, and navigation. Since we would be using a safety reel tied off to the anchor line the navigation part would not be too difficult, but I still needed to get us oriented in the correct direction so we could find deeper water; I needed to reach at least 60 ft. in order for the dive to count towards my 60ft depth certification. I took a giant stride off the stern, tapped my head to signal I was ok, and reached up to grab the camera. I attached it to the D ring on my right, as I already had my octo, computer, and a reel attached to my left D ring. We descended along the anchor line to the top of the pinnacle, and I tied off the safety reel to the anchor line, which was a more difficult task than usual because I had to hold the camera and deal with surge. 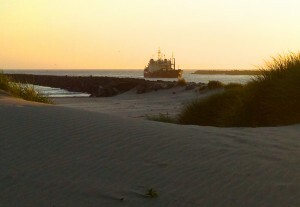 Once the line was secure, I used my compass to find East, and I signaled for us to swim in that direction. We slowly made our way along the reef, keeping our eyes peeled for octopus as I experimented with the camera, still figuring out how to orient the lights. 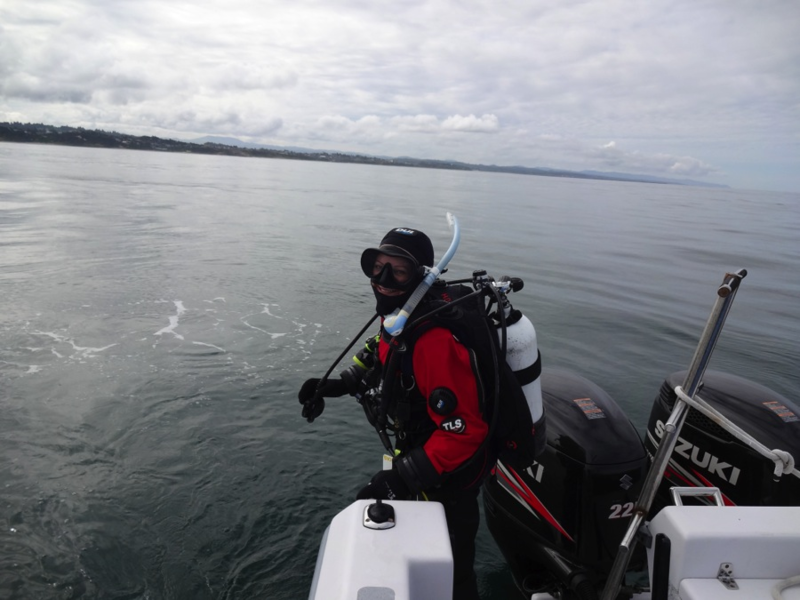 Even with the task loading, my air consumption was better than it had been on previous off shore dives, and I could tell that I am getting used to the Pacific North West conditions. I tried to take interesting shots and get as close as possible to each subject in order to capture as much detail as possible. 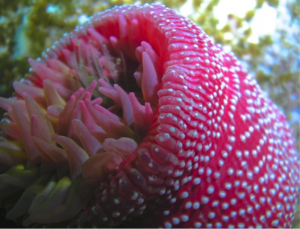 This entry was posted in 2013 AAUS Scientific Diving on March 5, 2014 by Vallorie Hodges. I have finally completed the last requirements towards becoming a fully certified AAUS scientific diver! The process began while I was still at home in Pennsylvania, with a medical exam to attest to my diving fitness. Recreational divers are required to have a similar medical exam when they initially get certified, however to remain certified as a scientific diver you must complete a medical examination every 5 years until the age of 40, with more frequent medical exam requirements after that. 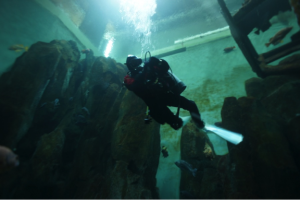 Throughout my first few weeks at the aquarium, I completed the preliminary requirements towards completing the certification, such as swim tests and open water checkouts. The swimming evaluation consisted of four components: swimming underwater for 25 yards without surfacing, swimming 400 yards in less than 12 minutes, treading water for 10 minutes, and transporting another person 25 yards in the water. 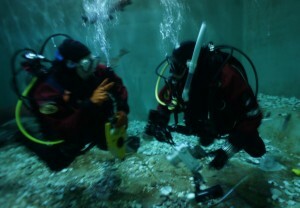 Initial scuba skill checkouts were basic- remove and replace mask, regulator recovery, alternate air source. As the weeks continued I worked on fine tuning my buoyancy skills and using more advanced skills, such as hovering gear removal and SMB deployment, working with reels, lift bags, and hardware- all while wearing 7mm gloves of course. My skills were put to test when I completed an underwater obstacle course that Jenna set up in the Shark Observation Pool. Before getting in the water I put pieces of material in my mask so that I was ‘blindfolded’. I finger crawled along the down line to make sure that I was descending at the proper rate. Once I got to the bottom I followed another line until I got to the first station- nut and bolt assembly. There were two bolts, one with nuts and washers on it and another that was empty. I had to take the nuts and washers off the loaded bolt and move them to the empty one. I wrapped the line around one of my arms to prevent myself from drifting off and loosing the obstacle course. One by one I removed the nuts and washers and put them on the other bolt. Once I screwed on the last nut Jenna grabbed my hand and wrapped her thumb and forefinger around my thumb, signaling I had completed that task and could move on to the next station. I made an O with my fingers around the line and followed it to the next station- mask removal to un-blindfold myself. I removed my mask, took out the material, replaced the mask, and cleared the water out. Ahh I could see again! I again followed the line to the next station- knot tying. First, I used the line to tie a clove hitch around a shark stick. Jenna gave me the ok signal and I untied the line and tied a bowline around a ring of PVC. Then I followed the line to the final station. Rope was bundled up and zip tied together. I used my knife to remove the zip tie and handed Jenna the rope. I had completed the obstacle course and even managed to keep my air consumption at its usual rate! Scientific diving depth certifications are slightly different than those for recreational diving. As a trainee, the permit level depth limit is 30ft., which can be exceeded with the permission of the DSO. From there, depth certifications are to 60, 100, 130, 150, and 190ft. 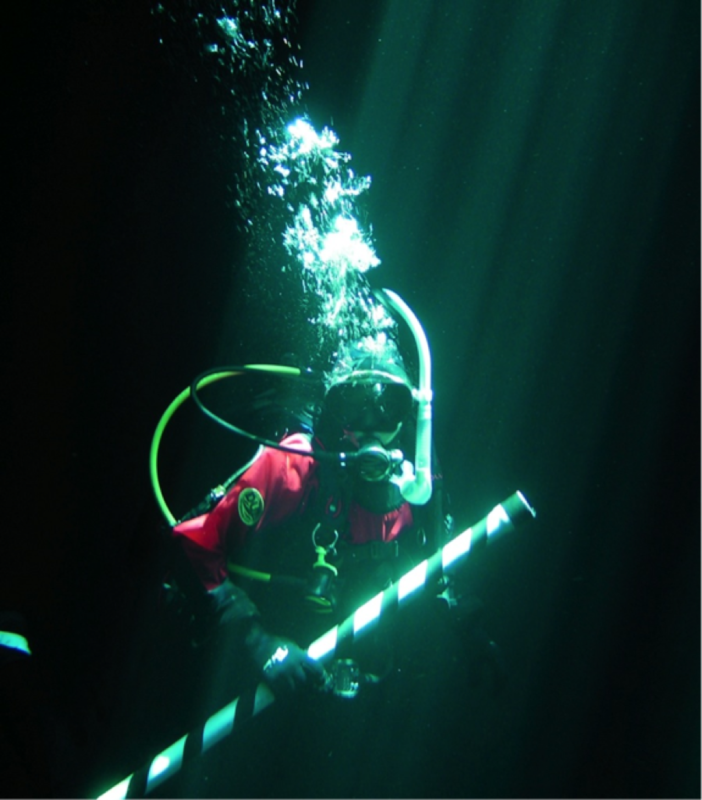 At each level you must satisfy the minimum number of dives in that depth range in order to move to the next certification level. To get a 60ft. 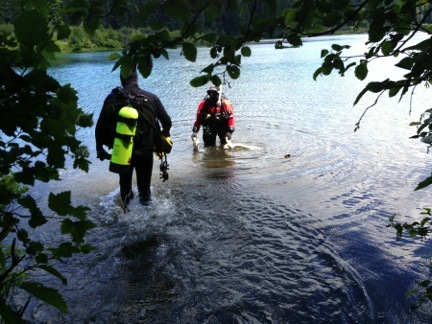 certification, for example, you must complete 12 open water dives between 31-60ft. 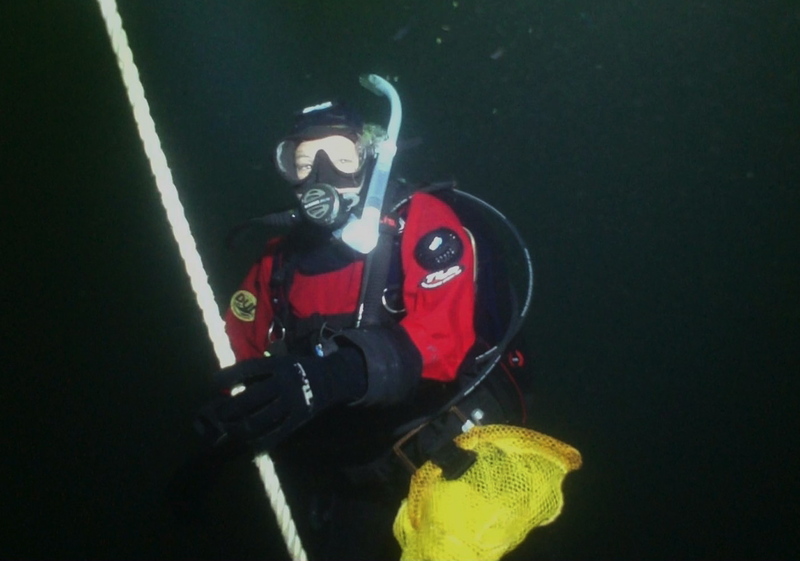 All subsequent certification levels require only 4 dives between the old and new certification depths. 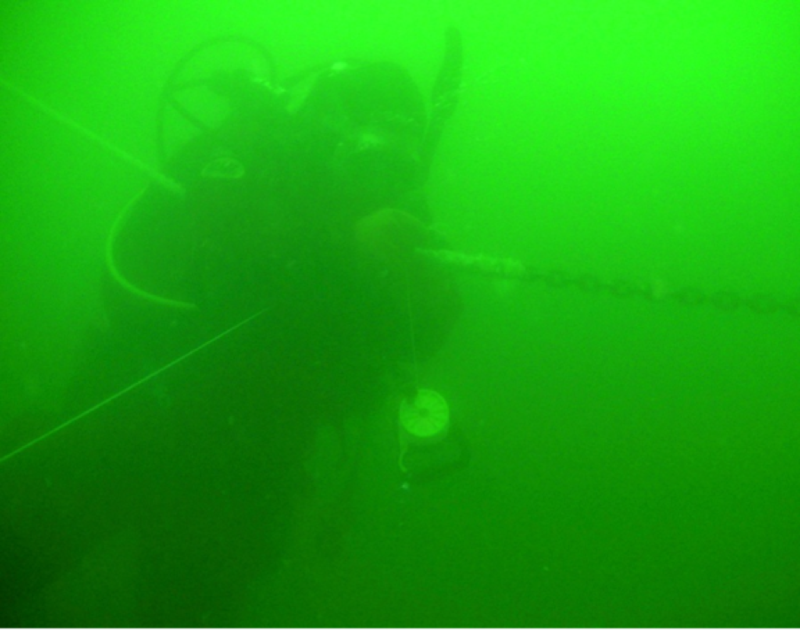 By the end of my internship I was able to obtain a depth certification level of 100 ft. The most notable difference between the recreational and scientific diving certification is the academic requirement. 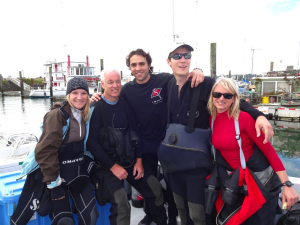 The written exam for the scientific diver certification covers a great deal of information; In fact it is required that a minimum of 100 hours is dedicated to covering academic concepts. AAUS powerpoints cover such topics as diving physics & physiology, AAUS standards, nitrox diving, harmful marine organisms, accident management and emergency care, diving under special conditions, and handling high-pressure cylinders. Each week I studied a few of the powerpoints and review the quizzes at the end of each topic with Jenna or Vallorie. It took, me about 6 weeks to get through all of them, at which point I was ready for the exam. It was a lot of material and I spent hours studying, but my hard work paid off and I breezed through the test. The last step towards becoming a scientific diver was completing an equipment exam. Jenna put together two sets of gear, each which had a number of problems. I had to inspect each set of gear and point out everything that was wrong with them. Some of the problems were easy to spot, like the BCD was not lined up properly with the face of the cylinder. Other details were more difficult to spot, such as missing zip ties around the mouthpiece of a regulator. With each set of equipment I was able to quickly list of a number of problems I saw right away, but then had to spend a few minutes staring at the gear before I found all the problems. This was a great exercise because it teaches you to inspect gear with extreme scrutiny. The more I inspect gear the easier it will become for me to spot out potential problems, increasing not only my safety, but also the safety of my dive buddies. 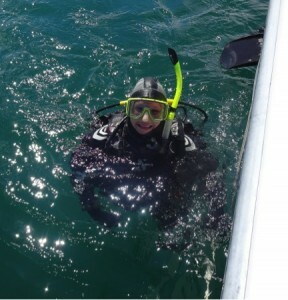 This entry was posted in 2013 AAUS Scientific Diving, Internship Journeys on March 5, 2014 by Vallorie Hodges. Recently I had the incredible opportunity to scuba dive in Clear Lake, a serene, freshwater lake that sits about 75 miles east of Eugene. I was told about the lake by Sean Nolan, a friend through the aquarium and NAUI instructor. After hearing about my recurring low visibility dives on the coast, he graciously offered to take me to Clear Lake, where the visibility is known to be up to 200 feet! 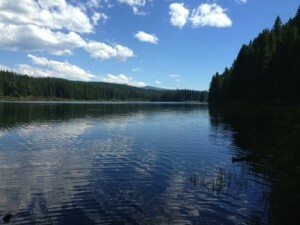 Besides the obvious allure of great visibility, this would also give me experience with altitude diving, as Clear Lake sits at an elevation of 3,012ft. I discussed the plan with Vallorie, who liked the idea of broadening my dive experience, and approved the trip pending my submission of a dive plan. The drive from Eugene to Clear Lake was beautiful; I especially liked the fact that it was sunny and 85 degrees out, one of the benefits to leaving the coast and heading to the valley. Clear lake is situated in the Cascade Mountains and serves as the headwaters to the McKenzie River, the primary source of drinking water for Eugene. Volcanic eruptions 3000 years ago, created the beautiful oasis, leaving behind breathtaking scenery of volcanic rock that seems to tumble into the lake, and a unique bottom composition of thick ash. Because of this, it is important to avoid touching the bottom while diving so as not to diminish the visibility. Finely tuned buoyancy control and a modified frog kick with fin tips pointed toward the surface) helps to avoid disturbing the ash bottom. Clear lake is primarily fed by snow runoff, which filters through underground caverns for more than 20 years before emptying into Clear Lake. Its glacial origin results in very cold water, about 40°F or less year round, making a drysuit essential for a comfortable dive. The fact that inflow is primarily from subsurface drainage through volcanic rock results in an unusual chemical and biological composition. 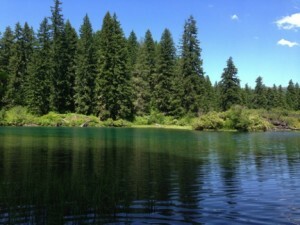 Major ion concentrations are higher than most other Cascade lakes, however nutrient supply is limited. The chemical composition, in addition to the frigid temperatures, gives rise to an oligotrophic lake, meaning that primary productivity is very low. The biologically unproductive waters are left very transparent and saturated with dissolved oxygen. We entered the water on the western bank, and made our way towards the center of the lake where the depth increases to about 45ft. As soon as we hit deeper waters I immediately wished I had an underwater camera; the crystal clear water reminded me of the tropics, minus the warm water and bustling coral reefs. Although this water wasn’t teeming with life, there was still plenty to see. Brilliant fields of green algae pillowed over the ash bottom like giant blankets, and a canyon of hardened lava protruded from the northern edge of the lake. We swam south, closely inspecting the algae and admiring the incredibly serene and clear water. Even in a dry suit I began to get cold within a half an hour, even shorter for Sean who was diving wet. The profile in my dive plan stated that our bottom time would be 40 minutes, so when we hit the half hour mark we turned around and made our way back to the exit point. We both had the same response upon surfacing… we wished we had an underwater camera! 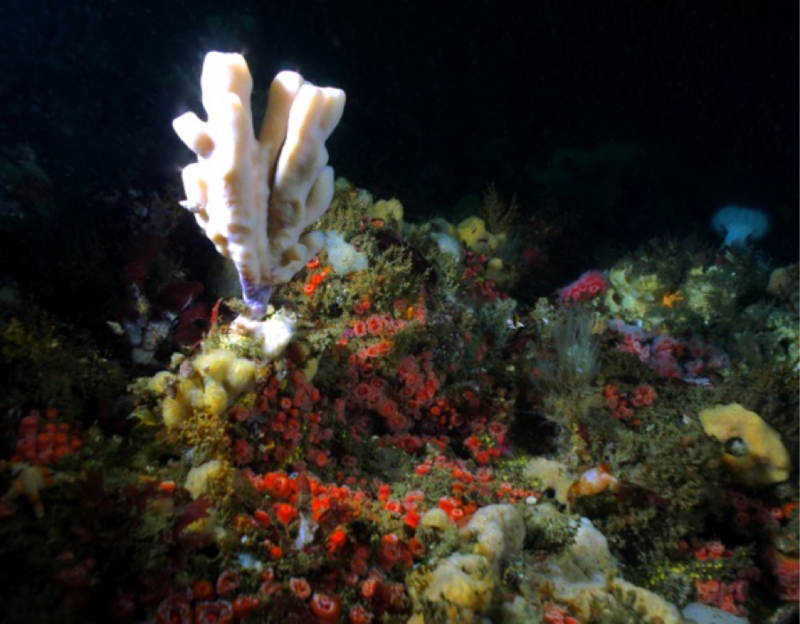 This entry was posted in 2013 AAUS Scientific Diving on December 2, 2013 by Vallorie Hodges. 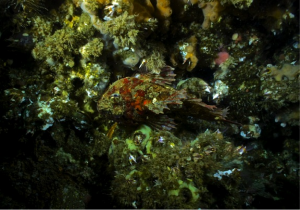 In an effort to document changes in Northwest rockfish populations, Oregon Coast Aquarium has collaborated with the Seattle Aquarium and Point Defiance Zoo to survey rockfish populations in the Pacific Northwest. I was eager to participate in this project, not only because it would allow me to work on my videography skills, but also because I would have the chance to dive with a full-face mask. There are a number of advantages to diving with a full face mask, including limiting exposure to cold temperatures or contaminated waters, as well as allowing you to communicate underwater through either hardwire or wireless communication devices. This project takes advantage of underwater communication to improve the accuracy of the surveys by combining in-situ audio data with a visual recording of the test site. The first step was getting trained for diving a full-face mask configuration. Along with seven other scientific divers from the aquarium I settled into the conference room for the classroom portion of the training. Any time you are diving with new equipment it is important to understand how that piece of equipment works and the risks associated with it. By having both a knowledge and skill based appreciation for your dive gear, you will be better prepared to react to situations that may arise. After learning about the background/ methodology of the project and going over the specifics of diving with a full-face mask, it was time for some in water training in Passages of the Deep. 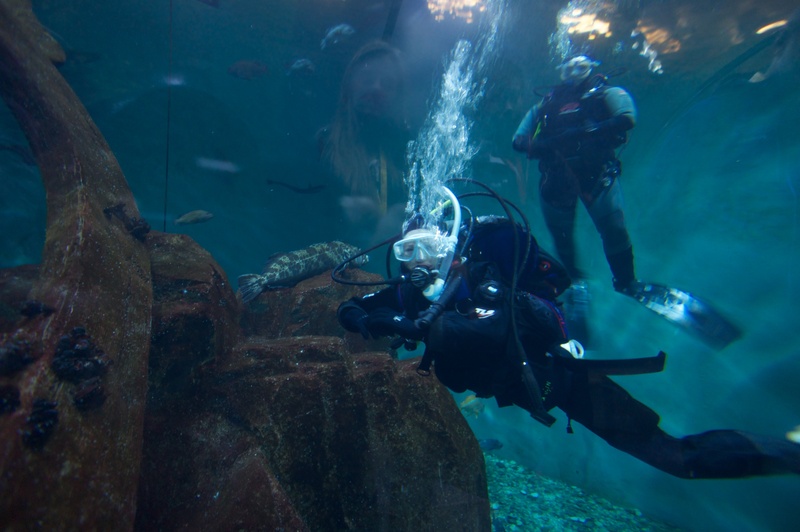 The first group of divers geared up, adjusted the masks in order to get a good seal, and got in the shark observation pool, a small enclosure connected to Open Sea (the exhibit holding the sharks and rays), which is used for feeding the rays and introducing new animals. This was an ideal place to get familiar with using a full face mask because it is shallow, only 12 feet deep, and the water temperature is slightly warmer than Halibut Flats. Unfortunately when it came time for me to try out the masks, my face was too small to get a good seal. Vallorie assured me however that I would still be able to work on the project wearing a conventional mask. 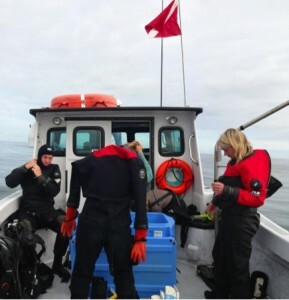 Once the rest of the crew were comfortable with removing and replacing their masks, we got into Halibut Flats to practice setting up transects and using the video camera. A few days later it was time to try out our new skills in open water. Jim, Vallorie, myself and four other AAUS Scientific Divers set out on Gracie Lynn for North Reef, which was selected as one of the survey sites for the rockfish project. The first buddy team went down to place the block that we would start the survey from. Once they had it in place, they signaled their location by deploying a surface marker buoy, which cued Vallorie and I to get inthe water. We descended along the anchor line and pointed our compasses towards the heading we had taken on the surface. The visibility was only about 5 ft. but within a few minutes we were able to locate the other buddy pair waiting by the block. I clipped the transect tape to the block and we swam south along the wall to conduct the survey. Visibility was poor and the current made it a challenge to remain in proper positioning with Vallorie, but we made it to 50 meters, at which point I signaled to Vallorie that it was time to turn around. On the way back towards the block, the camera housing started beeping, signaling that a leak was detected. 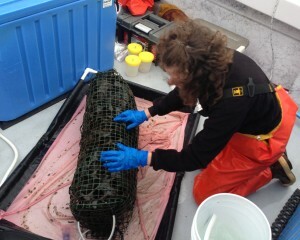 We quickly got back to the marker buoy and ascended to care for the camera. Once on board we washed the housing with fresh water and carefully took it apart. 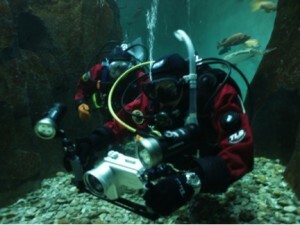 This should be the first step any time you suspect a leak in your underwater camera housing. We then placed the camera in a zip lock bag with desiccant pellets in hopes that it would dry out before any damage was done. We were unable to use the camera the rest of the day, but luckily this was just a training day and it was not critical that we collect data. 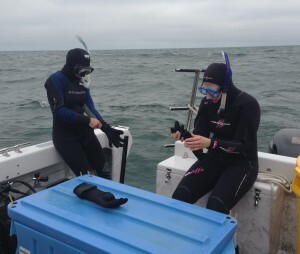 We spent the rest of the dives working on skills such as navigation, setting up transects, and deploying surface marker buoys, and also had the chance to collect invertebrates for the aquarium. 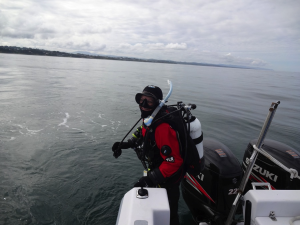 Although some may consider the low visibility, high surge water to be less than ideal diving conditions, I feel that the difficult working conditions enhance training dives. 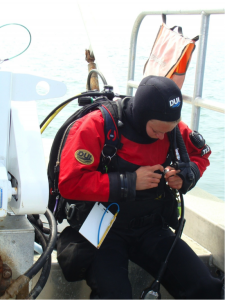 If you can successfully handle equipment and manage task loading in these conditions, you will be much better prepared for future dives no matter where they are! This entry was posted in 2013 AAUS Scientific Diving, Internship Journeys on October 31, 2013 by Vallorie Hodges. 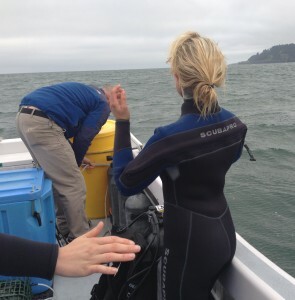 It was my fourth week in Oregon and time to experience my first collection dive. We took Gracie Lynn offshore to North Pinnacle and anchored on the crest at a depth of about 40 ft. 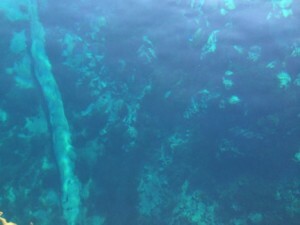 The warm and sunny weather we have been enjoying for the past week came with a caveat, plankton blooms made visibility in the upper 30 ft. of the water column very poor. Additionally, the surge in the 30-40 ft. range made it difficult to work, especially when trying to pry invertebrates off of their hard substrates. So we headed to deeper water to find our living treasures. 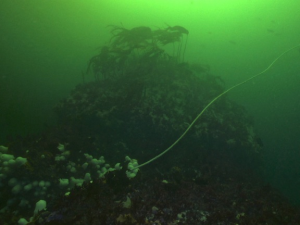 After tying a safety reel to the anchor line we swam to the edge of the crest where the sea floor drops suddenly to a depth of just over a hundred feet. 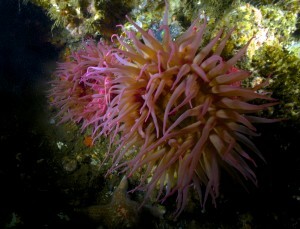 We descended down the wall, which was covered in plumose anemone, and made our way west. The visibility was greatly improved at this depth and I was finally able to see what the north pacific waters had to offer. 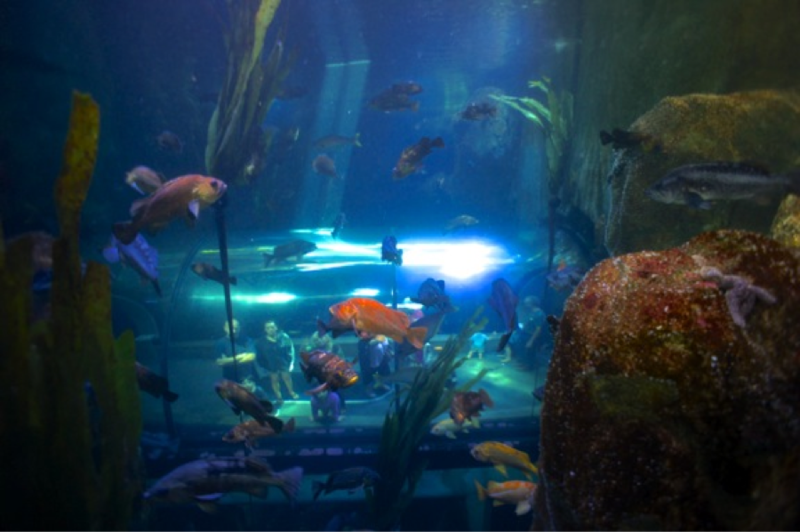 I watched carefully as Captain Jim, the director of husbandry, and Roy, one of the aquarists at the aquarium, searched for their target animals, and scooped them into their goodie bags. 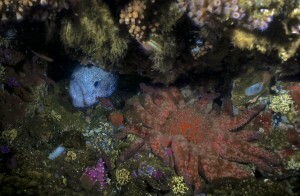 As we used our lights to peer into dark crevices along the wall, we came across a juvenile wolf eel. After a few failed attempts to coax the eel out of from his hiding place, we decided to leave it be and start heading back to the anchor line. Once we got back to the boat, I climbed aboard and helped to pull up Jim and Roy’s goodie bagswhich held an array of organisms including moonglow and Christmas tree anemones, burrowing sea cucumbers, sea lemon nudibranchs, and a chalk lined dirona, as well as hairy tritons, granular claw crabs and a sharpnose crab. We emptied everything into a barrel filled with seawater for the journey back and pulled up anchor to head back towards the bay. Back at the aquarium, some of the new organisms went to exhibits to be put on display, while others went to the education department. Many of the exhibits in the aquarium reflect Oregon coastal habitats, making local collections a key method for stocking exhibits. This entry was posted in 2013 AAUS Scientific Diving on September 17, 2013 by Vallorie Hodges. Early Thursday morning I packed my diving gear onto Gracie Lynn, the aquarium’s research vessel used for off coast specimen collection and scientific dives. We pushed off the dock a little after 6 a.m. and set out to go SMURFing. SMURF is an acronym for Standard Monitoring Unit for the Recruitment of Fish, and is a cost-effective tool used to determine spatial and temporal variability in abundance and diversity of settling fish larvae. The SMURFs consist of about 60 sq. ft. of snow fence, which is bundled up and encased in green garden fencing. The finished piece is sausage-shaped and about a meter long. The color and design of this simple tool is appealing to juvenile fish who are seeking shelter. The fish are free to swim in and out of the SMURF, so it is important to quickly enclose the entire apparatus in a net, known as a BINCKE (Benthic Ichthyofauna Net for Coral/Kelp Environments), upon collection. The SMURFs are attached with clips to a mooring line a meter below the surface. The shallow working depth allowed us to use snorkel as our means of retrieving/ replacing the SMURFs. Kirsten Grorud-Colvert, the lead scientist on the project, and I were dropped off at each buoy while the boat circled around waiting for us to complete the task. With me carrying the BINCKE, and Kirsten carrying the replacement SMURF, we approached the buoy. I waited for Kirsten to unclip the SMURF from the mooring line and replace it with the new SMURF. As soon as she unclipped the old SMURF I scooped it into the BINCKE and we signaled for the boat to come back and pick us up. 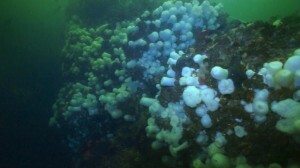 There were a total of eight SMURFs deployed from the Southern Boundary of Pirate Cove to Rocky Creek Wayside (excluding Whale Cove), seven of which were still in tact at the time of collection. One was missing, most likely dislodged from strong currents or knocked off from driftwood, so we replaced it for the next round of collections. By the second SMURF collection Kirsten and I had the routine down and it only took a few minutes for us to collect and replace the SMURFs. Once the retrieved SMURF was onboard, one person bailed seawater over the SMURF as another person shook it to flush out the fish. 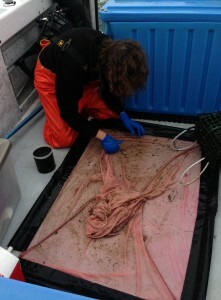 The fish were collected, and stored in individually labeled bags, which were kept on ice for transport back to the lab. The information gathered from SMURFs provides insight about settling patterns in early life stages for many nearshore fish species. 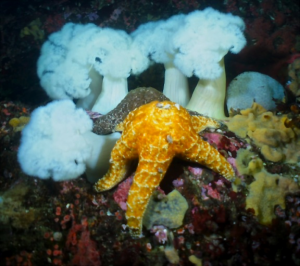 This information is essential for effect marine conservation management, and will also act as a platform for educational outreach about the early life stages of marine organisms. As an efficient and low-cost method for sampling this type of information, it is hoped that SMURFs will become prevalent in large-scale monitoring projects throughout the west coast. This entry was posted in 2013 AAUS Scientific Diving on September 8, 2013 by Vallorie Hodges. This week I was trained as fill station operator so that I can fill scuba cylinders. It is very important to be properly trained to handle high-pressure cylinders because of the hazards associated with them. A damaged cylinder, or improper filling techniques can cause a cylinder to explode, a serious danger to the person filling the cylinder and to anyone in the vicinity. The training included a PSI/PCI PowerPoint and quiz, as well as an orientation to the compressor room and fill station. We learned about cylinder markings, different types of cylinders and compressors, how to conduct a cursory inspection, and cylinder maintenance. After completing the classroom portion of the training, we headed to the fill station and each went through all the steps involved with filling a cylinder, including visually checking the cylinder for proper markings, making sure it is up to date on inspections, and actually filling the cylinder. I became even more familiar with the components of high-pressure cylinders by helping Vallorie, my supervisor, service a cylinder that was due for its annual inspection. I learned how to take the cylinder valve apart, go through the required checklist for annual inspections, replace the O-rings and burst disk, and put everything back together again. After a full day of learning about cylinders, I was ready to kick back and relax. I attended Rogue Brewery’s ‘science on tap’, an event in which local scientists come out to talk to the public about their projects. This month the focus was on citizen science. By bridging the gap between the general public and the scientific community with projects such as REEF and marine debris monitoring projects, we are able to gather information that could be critical to coastal habitat sustainability and conservation. The idea is that success of conservation projects will come through integration rather than implementation. This is especially true in towns such as Newport, where the fishing/marine industry drives the economy. With much of the public already holding close ties to coastal ecosystems, citizen science projects will further engage fishermen and the general public in the health of coastal ecosystems, further increasing the success of conservation efforts. As the presentation wound down, the floor was opened up for questions, and I was extremely impressed by the level of interest expressed by members of the community. Thoughtful questions and suggestions continued for about 40 minutes, proving just how engaged the community is. As I sat there listening to the lively discussion, I couldn’t help but think how unique of a situation it was. Not every community has members that are this active and willing to get involved. Newport seems to be the perfect place for citizen science projects to blossom, and I have no doubt that this is exactly what will happen. 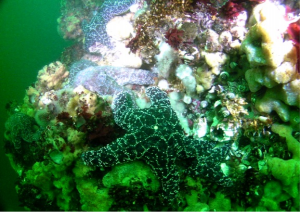 This entry was posted in 2013 AAUS Scientific Diving on August 31, 2013 by Vallorie Hodges. 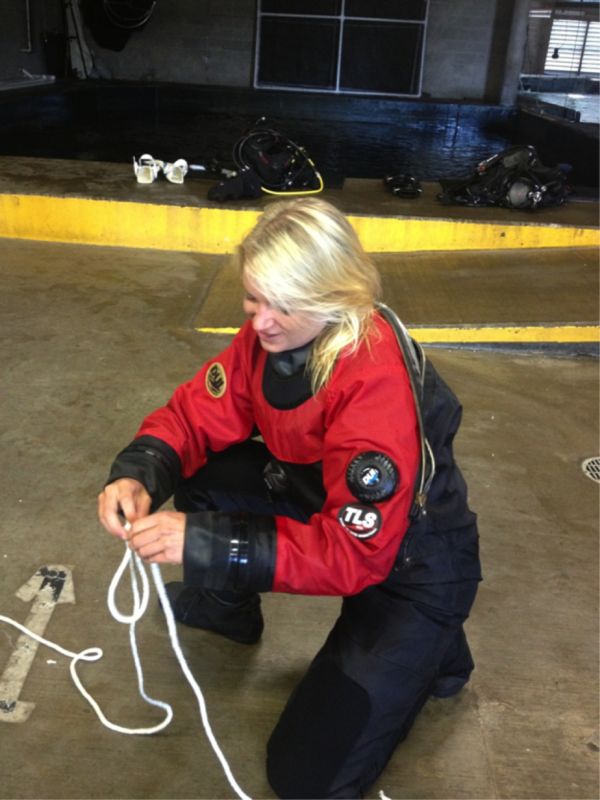 My name is Teresa Tymon and I was selected to be the 2013 OWUSS/AAUS scientific diving intern. I just graduated from the University of South Carolina as a marine science major and will start graduate school at San Diego State University this fall. 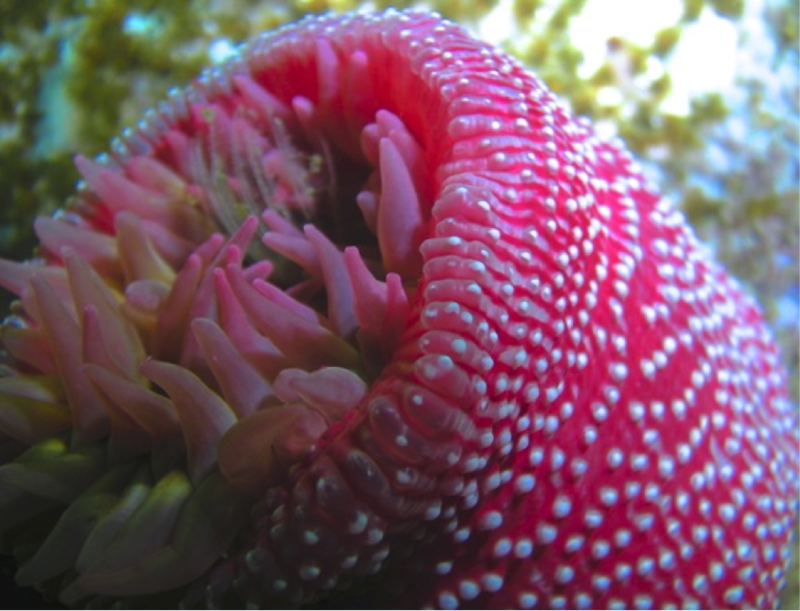 My main interest is in marine biomedicine, as marine organisms hold great potential for developing life saving drugs. I am also interested in promoting marine conservation through informing the public of the immense medical potential of the oceans’ inhabitants. I arrived in Oregon just over a week ago and already have met so many incredible people. 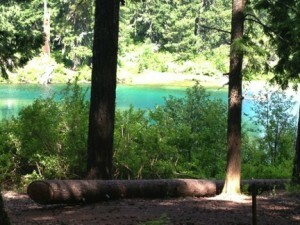 From the moment I arrived, Oregon has proven itself to be welcoming and captivatingly beautiful. I flew from my hometown, Lancaster, Pennsylvania, to Portland, Oregon. 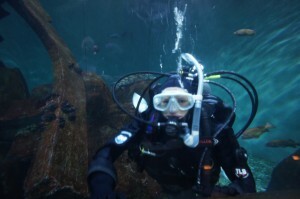 I needed to get from Portland to Newport, so Vallorie Hodges, the Dive Safety Officer (DSO) at the Oregon Coast Aquarium, sent an email to all the volunteer divers at the Aquarium asking for help. Within a few hours, multiple people opened up their homes and offered me a ride. I stayed with one of the volunteer divers the night I arrived and the next morning we made the beautiful drive down the coast to Newport. 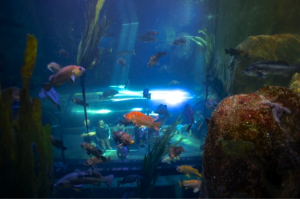 When I arrived I met Jenna Walker, the assistant DSO here at the Aquarium, whom I have been in contact with since I found out I was chosen for the internship. I spent my first few days at the Aquarium getting acquainted with the staff, exhibits and my new dive gear. 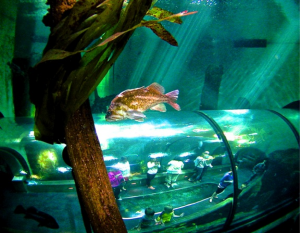 It was immediately evident that the Oregon Coast Aquarium is unique. There is a major focus on education and conservation, which is implemented through platforms such as interpretive dives and the Guest Dive Program. 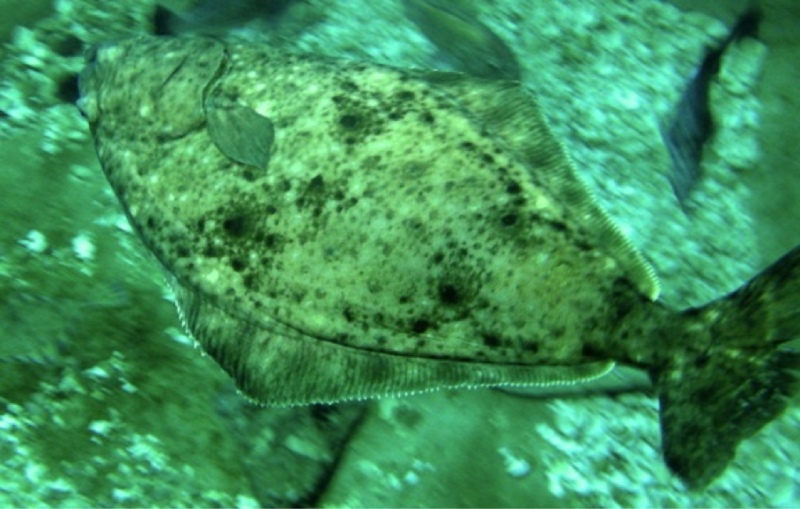 My first dive was in Halibut Flats, one of the largest exhibits at the Aquarium. 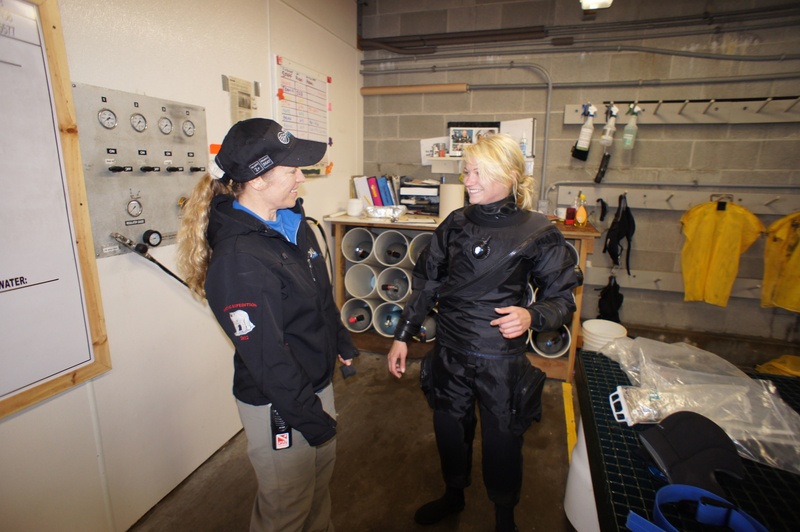 It was my first time diving in a dry suit, so using the suit to control my buoyancy instead of the BC took a bit of getting used to, but I think I am well on my way to becoming a skilled cold water diver! A few days later, I again descended through the chilly, 51 degree water in Halibut Flats. 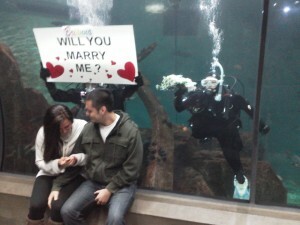 This time it wasn’t just to practice my dive skills, but to be part of an underwater wedding proposal. It was incredible to be part of something so important and special in someone else’s life. The day of the proposal, I also had the opportunity to dive in the Open Sea exhibit, which holds California bat rays (Myliobatis californica) as well as five species of sharks- soupfin (Galeorhinus zyopterus), brown smooth-hound (Mustelus henlei), spiny dogfish (Squalas suckleyi), leopard (Triakis semifasciata), and broadnose sevengill (Notorynchus cepedianus). I eagerly awaited my chance to dive with these incredible creatures and the experience did not disappoint. The immense power that sharks holds is strikingly juxtaposed by the grace with which they glide through the water. I look forward to spending more time in the water with them, and to all the incredible experiences I am sure to have this summer. This entry was posted in 2013 AAUS Scientific Diving on August 18, 2013 by Vallorie Hodges.